I am loving the sweater!!! I tried the sweater dress on in the store and it wasn't too flattering. ohh well! The first jacket is cute! Whenever I go into ON, I never find anything, but they have such cute stuff available online. I got the cutest argyle sweater there before I came back to school...unfortunately it has been much too warm to wear it! I'll have to look into those dresses; ON has been putting out such cute ones lately. saw the sweater-jacket in-store when I broke down and went there over this weekend (O-N is on a lot of our minds of late!) and thought it was adorable, the sizing did not work for the petite- but you have such lovely long, lean limbs, this would look great on you. liked it in navy and there was a crimson red that looked especially dashing! Oooh I must check out Old Navy! I love ON! As a teacher I'm always getting clothes stained with paint, food, etc so I don't like to spend a lot of money but I still want to look nice. ON gets the job done! Cute! Cute! Cute! 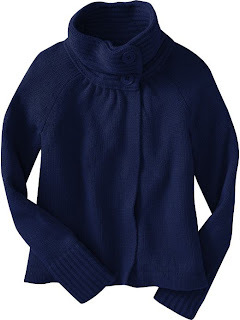 I have a dress similar to the navy blue one, but mine is tan and I wear a cute navy blue jacket over it! Love it!! 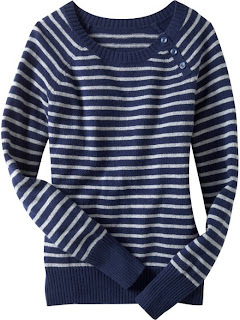 Isn't old navy just wonderful?! I just got a trench from there. That shirt dress is so cute. 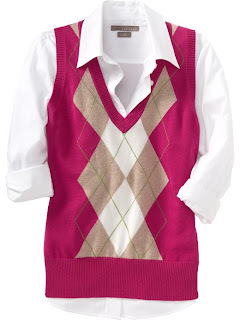 Lovelovelove the sweater vest, I may have to head over and pick one up! Looks Delightful and comfy! My style! That jacket is too cute! 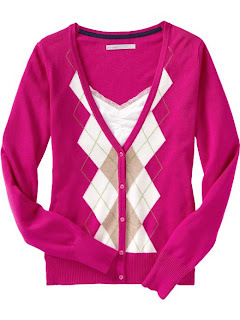 And the argyle looks are fun, you found some great pieces Miss Nautical! I had the best luck at Old Navy this summer and looks like this fall is going to be the same, wooohoo! !